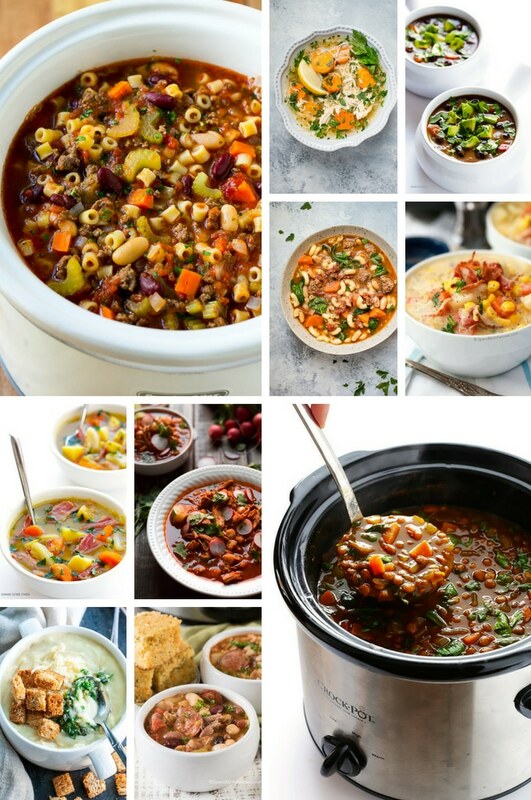 A comprehensive list of slow cooker soup recipes including bean soup, chicken soup, stews, chowders and potato soup. 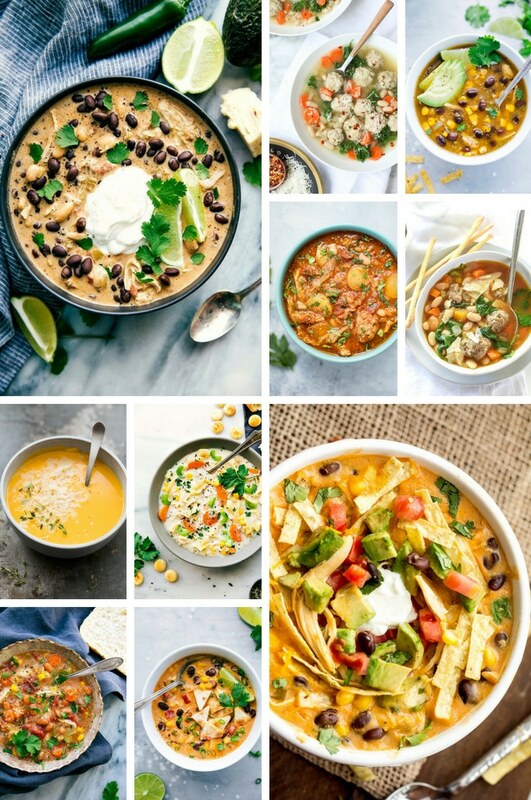 So many delicious options that are easy to make and perfect for a cold night! Soup is always a crowd pleaser and many times it’s a complete meal in one pot. I love to use my crock pot to make soup – it’s quick to put together and then you come home to dinner already done and waiting for you! Slow cooker soups are my go-to dinner option at least one night a week. There are so many different varieties that we never get bored, and I find that crock pot soups are typically super flavorful because they’ve had all day to simmer. I often make different varieties of chicken soup in the slow cooker, but sometimes I switch things up with a hearty beef stew or creamy potato soup. The great thing about slow cooker soups is that you can often freeze the leftovers. I often make a double batch just so I have some extra to put in the freezer! 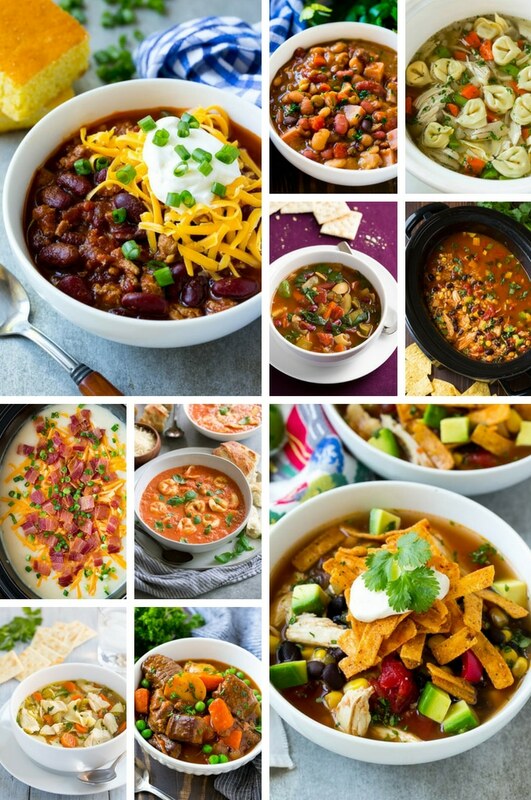 Chili, chicken soup and stews make great candidates for the freezer. 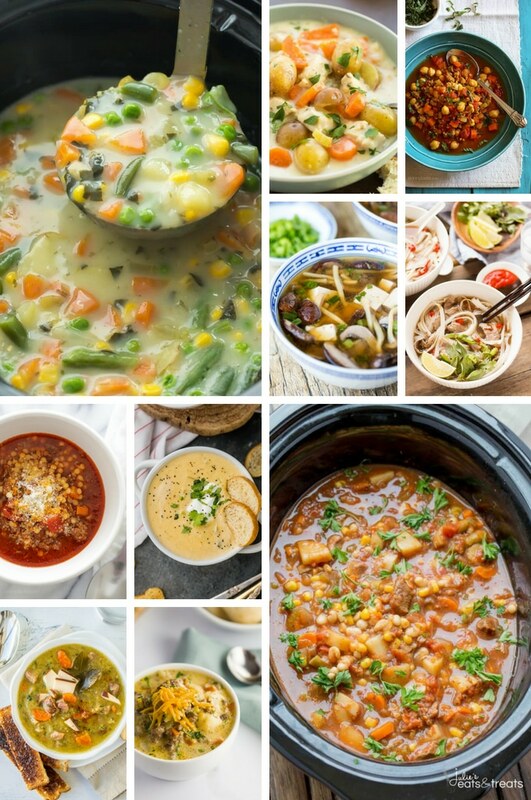 We enjoy a vast variety of slow cooker soup recipes so I want to share them with you. 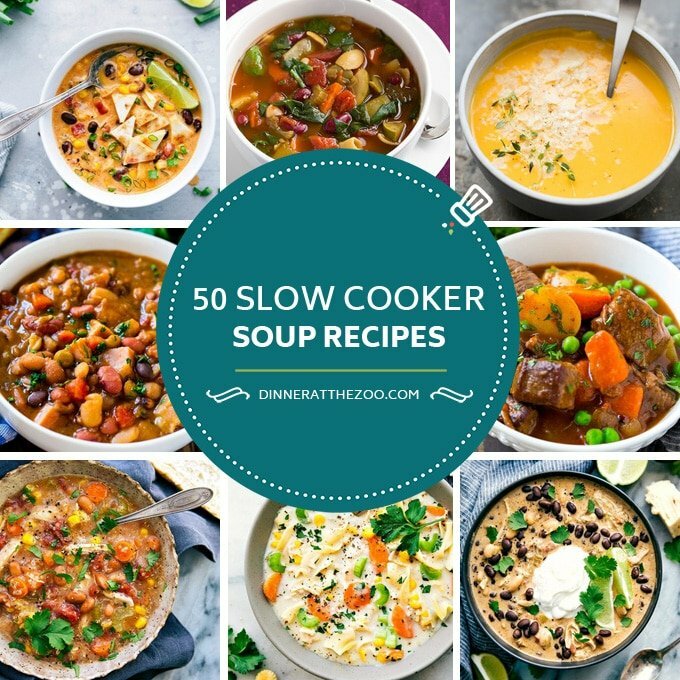 Here is a list of what I consider the top 50 slow cooker soup recipes! How long does it take to make soup in a slow cooker? Most crock pot soups can cook for 3-4 hours on HIGH or 6-8 hours on LOW. It’s important to consult your specific recipe for exact instructions. I could literally eat soup all day everyday so I LOVE this post!! I can’t wait to try some new recipes!! Fall means time for more soup recipes and I’m just so excited about that. I can’t wait to try some of these, they all look so good and delicious! 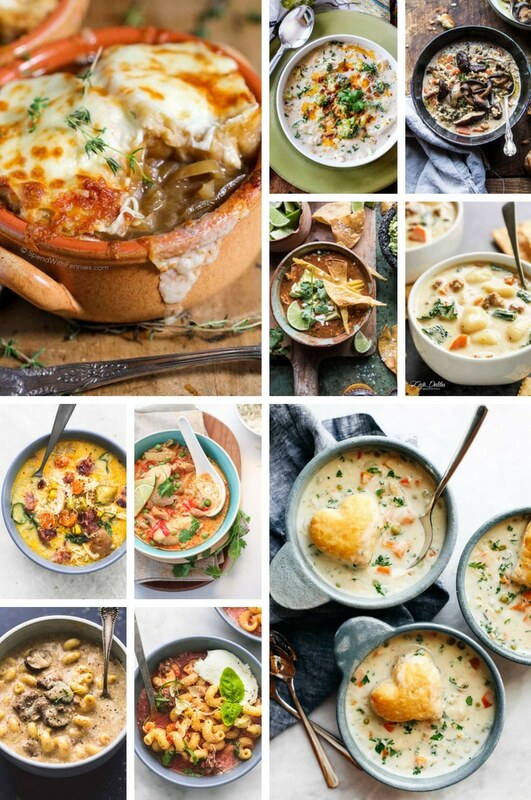 These soups look heavenly. I don’t have a slow cooker, I wonder if I would be able to achieve these without using one. I feel kinda silly for never attempting to make soup in my slow cooker! I’m going to have to try a few. So much inspiration! We have a slow cooker but never use it – time to whip it out! I’m overwhelmed by the options! I will have to come back and look at more later! What a nice selection. I love my slow cooker! It’s school season and the crock pot is my go to. I can’t wait to try some of these. 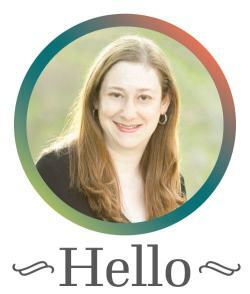 I must bookmark this post! I just got a combination crock pot/pressure cooker, and I need recipes! The idea of a chicken soup simmering all day sounds so good I can almost smell it! So many yummy recipes.. I can’t wait to give some of them a try. I love using my crockpot! These recipes look awesome. I’m bookmarking this page so I can come back for the recipes. Thank you for this. Yum, I love when I can use my slow cooker. I’ll have to keep some of these in mind for sure. There are so many tasty options! Yummy! Soups are a favorite meal at this household! I love the idea of making them in the crock pot because that means way less mess for me clean up. I want to try the Crock Pot Chicken Quesadilla Soup. So I now a meal plane for the next 50 weeks! I am totally making all of these to help thought out the year! I have a slow cooker that I do not utilise enough so this is a great post for me! I am going to up my slow cooker game for autumn as I totally need soup for then! I love taking a slow cooker recipe and throwing it in my instant pot! Same easy recipe, done in thirty minutes (usually ;)) thanks for this list!